Here is a Brisbane structure that could tell a tale or two. It is Desmond Chambers on Adelaide St in the CBD, a five storey plus basement building constructed around 100 years ago. The architects were Atkinson and McLay and the builder was Harry Roberts. Originally built as a combination warehouse and offices, Desmond Chambers has seen a variety of occupants over the years. The ground floor has been a showroom for such diverse purposes as automatic milking machines and motor vehicles. Other parts of the building have seen use as Commonwealth public service departments and commercial offices. During WWII it fulfilled such functions as a recruiting office and also a canteen for the Australian armed forces. There was local controversy when it was announced that the canteen in Desmond Chambers was going to serve beer on Sundays, and concerned citizens worried about their peaceful Sundays being spoiled by drunken servicemen. The local publicans were not amused either, seeing they were not able to open on Sundays themselves. Eventually the Army backed down, saying that there had never been an intention to serve alcohol on Sundays and that the newspaper article that reported that it was going to occur resulted from a misunderstanding. After the war, Desmond Chambers was the venue to collect the dole that was provided to returned servicemen who were unemployed. It was busy - a newspaper report in January 1946 indicated that the number of men claiming the dole was increasing rapidly, with five times as many men claiming it in that month compared with the previous month. 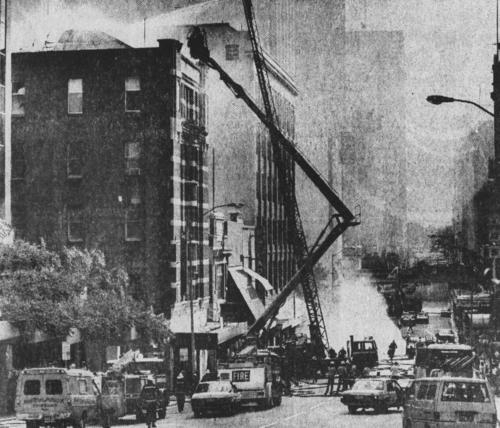 On Christmas Day in 1986, there was a fire on the rooftop of the building, with firefighters using extension ladders and hoses to battle the blaze. These days Desmond Chambers houses a snack bar and a skin care salon on the ground floor, whilst many of the offices in the floors above seem to house lawyers and interpreters. Well done Brisbane for not pulling Desmond Chambers down. The traditional red brick, broken up by the cream coloured render, would not have appealed to me 10 years ago. But since I had a good look at the winning presentation for Flinders St Railways Station in Melbourne, of the same era as your Desmond Chambers, it is now much more attractive. The glass windows on the ground floor look modern. I would prefer more Edwardian windows, perhaps even stained glass.